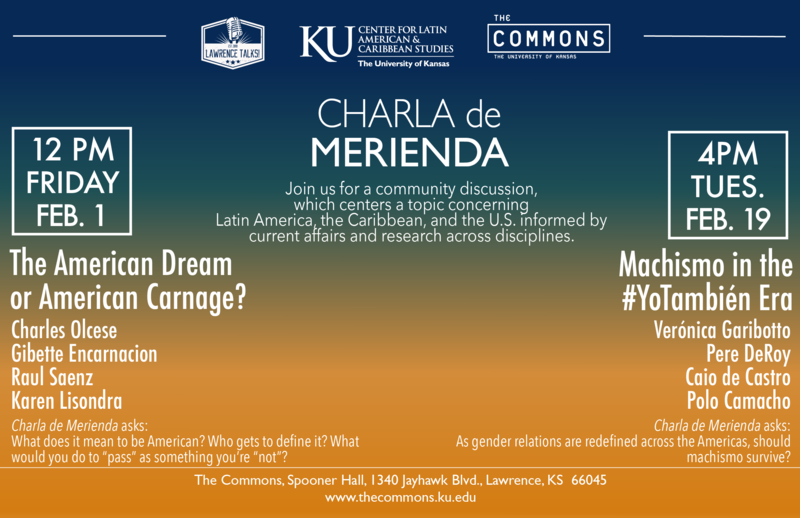 Charla de Merienda is a new collaborative series that carries forward the tradition of interdisciplinary discussion of research and current affairs in the Latin America and the Caribbean. Moderated by Lawrence Talks! Editor-in-chief, David Tamez, Charla de Merienda models critical debate through dialogue between members of the academy and community. The series is hosted at The Commons, a well-known space to engage with perspectives on broad topics and draw on diverse specializations and experiences. In collaboration, we bring people together to examine topics of national and local interest. Each discussion begins by examining facts to establish common ground, then guest speakers present prepared remarks (5-7 min), and a moderated community discussion follows. It is our hope that this model will raise awareness of the issues concerning the Caribbean, Latin America, and the United States and be of interest to: All Ages, Faculty, General Public, Graduate students, Researchers, Staff, Undergraduate Students. Machismo is the term and “social construct” that upholds patriarchy and, at best, expects males worldwide (including in Latinx and Latin American communities) to be brave, courageous, and strong providers. At worst, machismo underlies a decades long pattern of male aggression and violence towards women and marginalized communities. In the era of #MeToo and #YoTambién, Charla de Merienda asks: as gender relations are redefined across the Americas, should machismo survive? Join us for a riveting conversation in which we share facts, discuss opinions, and build common ground on matters concerning all of us.